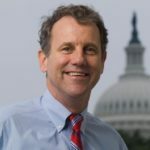 Throughout the course of the committee consideration of this bill, Brown offered multiple amendments to try and cut taxes for working people in Ohio, prevent jobs from being sent overseas and protect the healthcare of Ohioans, a press release said. All of those amendments were blocked by Republicans on the committee. “Instead of cutting taxes for working people in Ohio, this bill takes away their healthcare, raises their premiums and forces deep cuts to the Medicare program they’ve paid into for years. Why? All to pay for tax cuts for corporations that send American jobs overseas,” Brown said. Force a $25 billion cut to Medicare. Learn more about how the bill dismantles the Affordable Care Act to pay for tax cuts for corporations HERE. Learn more about how the bill forces $25 billion in cuts to Medicare HERE. Meanwhile, a new report released by the Center for American Progress (CAP) predicts dire consequences for Ohio under the Senate tax bill, which includes an amendment to repeal the requirement that all Americans have health coverage. According to the CBO’s analysis of the Senate bill, repealing the requirement would lead to 13 million fewer people without health insurance by 2025 and drive premiums up by 10% in 2019, leaving middle-class families to bear the brunt of the price increase. The GOP tax bill would also cut $25 billion from Medicare in 2018. Increase premiums for a middle-class family by an average of $1,480 in 2019. Leave 433,000 more Ohioans uninsured by 2025. Cut over $1 billion from the state’s Medicare funding. “Asking millions of middle-class families to pay more in taxes so that corporations and the wealthy few can pay less in bad enough. But to use those cuts to also undermine health care for middle-class families is unconscionable,” the report said.